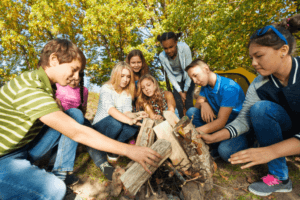 Guidelines – Trail Blazer Survival School, Inc.
We will have one central, group campfire. Use this one fire whenever possible. You may use other, nearby fire rings if necessary. Do not make additional fire rings without permission from an instructor. The central campfire is a great place for the evening meal and socializing. It is highly recommended that you bring your own tools, however if you need to borrow from other students or staff, please ask first and return to owner when finished. Remember to keep safety in mind. Always cut away from yourself when possible, wear gloves when sawing or using and axe, avoid chopping wood on the ground, use extreme caution when processing fire wood, etc. Some people do have phone signal at base camp, but please move away from the group when calling or texting. Photos are highly encouraged, but be considerate of others when taking pictures. Trail Blazer does take photos for marketing and social media. Group campfire area should be a phone-free zone. The group campfire area may be louder than surrounding areas. Keep noise level in mind when choosing the spot you pitch your tent or hang your hammock. We do ask that those who choose to stay up late to keep their volume down. Please dispose of trash in trash receptacles. Natural materials can be burned in campfire, but avoid plastics and metals that generate toxic fumes. Pack out what you pack in, and remember to leave your space better than you found it. Many state parks and national forest do not allow alcohol, and due to the nature of our training, and the risk associated with it, we do not allow alcohol at our camp without the permission of owner or lead instructor. Although we fully support gun rights, and the right to bear arms, we ask that students leave their firearms at home, unless the class or workshop dictates the need for them. Law Enforcement officers are welcome to carry. Other certified and trained weapons permit holders will be considered on an individual basis. Contact us for approval. When you book an event with Trail Blazer Survival School & Adventures, it is our commitment to hold a space for you and possibly turn others away from that particular event. With this in mind, please understand that we must be firm in adhering to our refund/credit cancellation policy. If you find it necessary to cancel your schedule class, course, workshop, please notify us as soon as possible. To hold your reservation, we current require payment in advance. We do accept cash, check ( check if received at least 30 days prior), MasterCard, Visa, Discover, or American Express via PayPal. Cancellations up to 30 days prior to event date – 90-% Refund or 100% credit toward another event. Cancellations 29 days to 7 days prior to event date – 80% Refund or 100% credit toward another event. SUMMER CAMP REFUND POLICY: DUE TO HIGH DEMAND, LIMITED SPACE AND EQUIPMENT THAT IS PURCHASED SOLELY FOR EACH CHILD ATTENDING THE CAMP, WE DO NOT GIVE A REFUND OR CREDIT ON SUMMER CAMPS THAT ARE CANCELLED.